High speed floor buffers are your machine of choice when buffing and polishing hard floor surfaces. 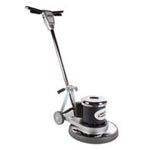 The battery powered floor burnishers and electric floor burnisher buffers are the more popular machines for floor polishing jobs. If you're intending to use one of our propane burnisher buffers make sure to work in a well ventilated area so there isn't a build up of exhaust. The most popular polishing pads are our champagne polishing floor pads and our aqua polishing floor pads. Hair polishing pads and pink polishing pads are more aggressive fibers and are only suitable for hard wax surfaces; they may damage softer wax surfaces.